Rig Veda, tenth Mandalasuktas 81 and 82[i] RV carries two suktas in the name of Vishvakarma so also of Indra, Agni and Maruts. The citation goes as Rishi Vishvakarma Bhauvana, the Creator Vishvakarma, the maker of all that exist in the world manifested, who executes the process of creation on the earth and heaven as a Designer. Vishvakarma in sukta 82 is addressed as the father of vision, wise in spirit, originator of the two worlds, rich in light, having the comprehensive mind. He is the Disposer, Ordained and the highest Seer. He knows all the worlds and domains and He alone assigns the names to the Gods. Lord Sri Vishvakarma is the origin of all sculptures, the creator of the varied architecture of this universe and the source of all forms, names and actions. He existed even before creation and is the cause of not only the cycle of creation, sustenance and destruction but even the condemnation and grace later on.Hekeeps Mother Gayatriin his heart and has provided refuge at His feet for Saraswati, the Goddess of Knowledge. Preoccupied with the dharma of their duties, Vishnu, Shiva, Brahma and other Gods rely on Him for their powers and are His instruments. He is beyond description (nirguna) and formless (niraakaara). He is as high as the Meru Mountain and is seated on an effulgent seat. He is adorned with bracelet, armlet, gem-studded garlands, a crown decked with divine gems, earrings and yellow clothing. He shines like lightning and dazzles all the eyes that try to see Him. He is also known as Prajapati and Hiranyagarbha. The clouds are his vehicle. Through a yajna he created the universe and is the first yajnakartru.He is like the divine kalpavriksha and fulfils the desires of devotees who surrender unto Him.He is everlasting and is the ultimate truth.He is called the Lord of speech by Vedarshis. He is the ocean of origin for all the vedaagamas. 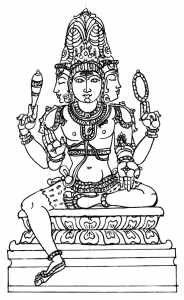 He is said to be equally versatile in jnana and karma yogas and can be considered to be the tattvic origin of all divine forms.He is the priest who makes offerings to the sacrificial fire, the father who created everything and the one who protects and nurtures everything. He is the cause for all the worlds to be glowing with prosperity and the one in whom all the worlds converge just the way all the spokes of a chariot wheel converge at the centre. The closing of His eyelids signify the end of the world and His auspicious glance is the cause of creation. Further, Stella Kramrisch adds, that ‘with regard to the making of universe, Visvakarma is the working, Brahma the thinking aspect of the Supreme Principle’. Varahamihira in the chapter on the Glory of Indra’s Banner, describes the jewels offered by the Gods to decorate the Indra Dhvaja. Amongst all the gods, the first to offer an ornament red like the Asoka flowers and of quadrangular form was Visvakarma, the celestial architect and followed by Siva, Indra, Yama, Varuna, Vayu, Skanda, Agni, Surya, Tvasta, Visve-Devas, Guru, Shukra and other sages. These ornaments are taken as the celestials are presided before the Indra-Dhvaja. This establishes the supreme place of Visvakarma in the order and cadre of the deities worshipped in any of the auspicious occasions or temple festivals. There are quite a number of historical inscriptions in the temples, where the mentioning of the historical architect in comparison with the celestial architect Visvakarma. One such inscription found on the mantapa of the Purana Mahadeo Temple, Sikar Rajputana states, “The architect (Sutradhara) of this temple of Siva (Sankarabhavana) was Candasiva, the famed son of Virabhadra, omniscient like Visvakarman in the science of architecture” The Visvakarma tradition in temple building is of greater significance and many of the texts have been compiled and working manuals were created from time to time by the master artisans on the basis of the science and art of architecture and iconography of the Visvakarma lineage. 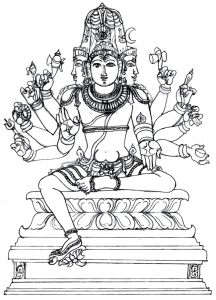 The icon of Visvakarma Panchami Brahma has the five faces representing Sadyojaata, Vaamadeva, Aghora, Tatpurusha, Eeshaana aspects and ten hands holding on right side trishula, chakra, bana, sarpa and akshamala, while on left side holding dhamaru, sankha, dhanus, vina and kumuda pushpa, signifying the attributes of the trimurti namely, Brahma, Vishnu and Mahesha. 2. I salute the Lord of the world, Sri Vishvakarma, who is the cause of not only the cycle of creation, sustenance and destruction but even the condemnation and grace later on, who is adorned with bracelet, armlet, stone-studded garlands, a crown decked with divine gems, earrings, yellow cloth and having the clouds as vehicle and who fulfils the wishes of His devotees. 4. I bow to Lord Vishvakarma who is the priest who makes offerings to the sacrificial fire, the father who created everything, the one who protects and nurtures everything, the cause for all the worlds to be glowing with prosperity and the one in whom all the worlds converge just the way all the spokes of a chariot wheel converge at the centre. 5. I prostrate to Lord Vishvakarma, the closing of whose eyelids signify the end of the world and whose auspicious glance is the cause of creation. 6. I bow to Lord Vishvakarma in whom, preoccupied with the dharma of their duties, Vishnu, Shiva, Brahma and other Gods rely on for their powers and whose instruments they are. 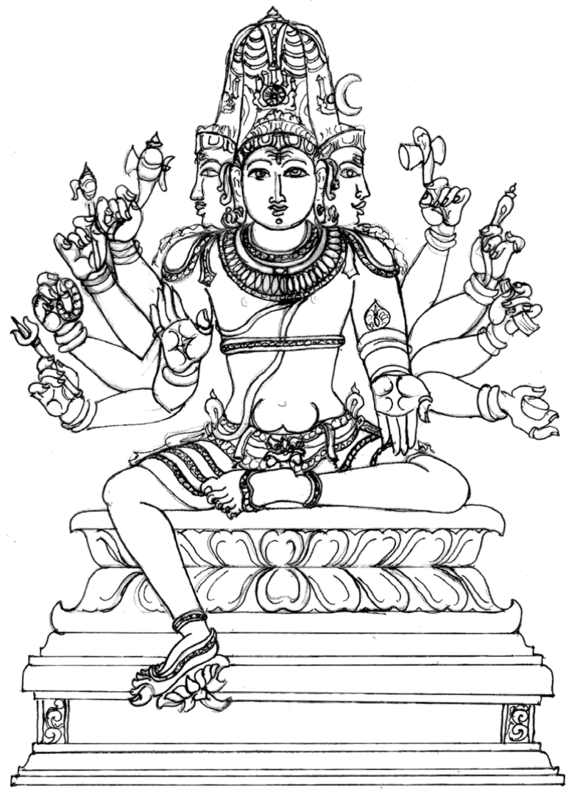 Vishvakarma has the form of Shuddha (pure) Brahma and is effulgent with five faces. These five faces are called Sadyojaata, Vaamadeva, Aghora, Tatpurusha, Eeshaana. The five Vedas originate from these five faces. The five Brahmas namely Saanaga, Sanaatana, Ahabhoovana, Pratna and Suparna were born from these five faces. 1. I constantly prostrate to the Shuddha (pure) Brahma, the form of Vishvakarma, who is effulgent with five faces, who is the reason for the five Vedas originating from these five faces, who effected the birth of the five Brahmas namely Saanaga, Sanaatana, Ahabhoovana, Pratna, Suparna, who existed even before creation and is the reason for creation, sustenance, destruction and the condemnation and grace later on, is everlasting and is the ultimate truth, for the fulfilment of all my desires. The first among the pancha brahmas was born out of the face Sadyojaata and is called Manu Brahma. He has the colour of a pure Sphatika flower (white). He is companion to Adishakti and is the epitome of peace. He is the lord of the Rigveda and is the founder of Rig shaakha. He is also known as Saanaga and Rudra and is the lord of the sacrificial altar having three corners. He is the founder of iron sculpture. Dark clouds are his vehicle. He is the lord of the eastern direction. 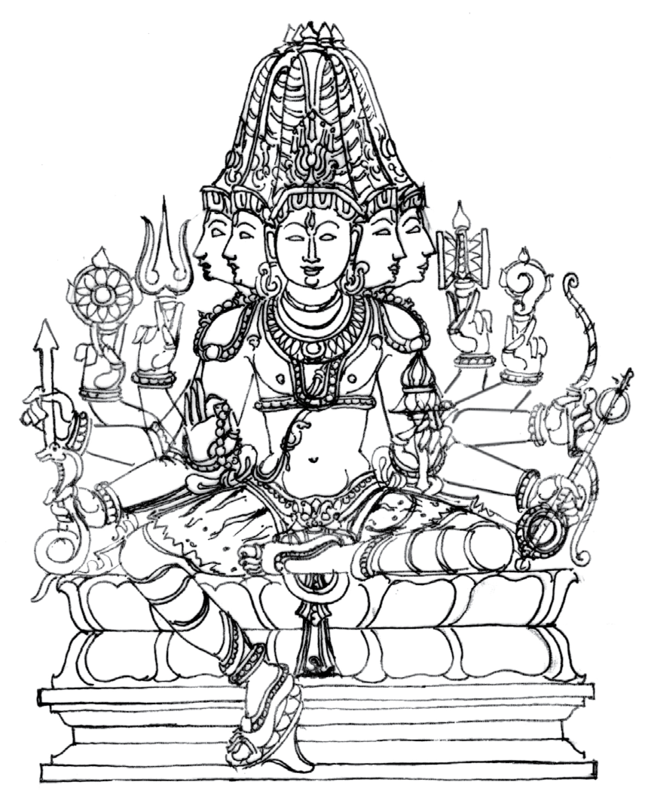 Lord Vishvakarma has five faces called Sadyojaata, Vaamadeva, Aghora, Tatpurusha, Eeshaana. The one who was born out of the face Sadyojaata was the first among the pancha brahmas and is called Manu Brahma. He has the colour of a pure Sphatika flower (white), is companion to Adishakti and is the epitome of peace. He is the lord of the Rigveda and is the founder of Rig shaakha. He is also known as Saanaga and Rudra and is the lord of the sacrificial altar having three corners. He is the founder of iron sculpture, the first of the five brahmas and has dark clouds as his vehicle. He is the lord of the East. I meditate upon and worship Him. 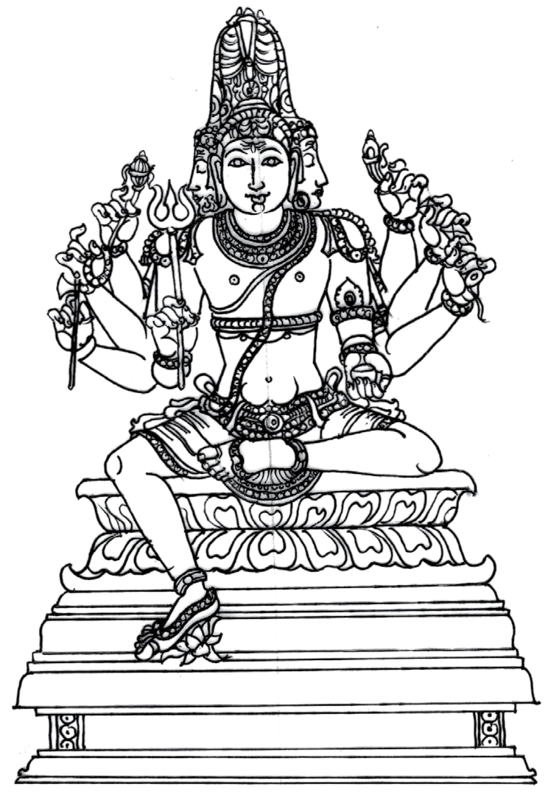 The second among the five brahmas, Maya Brahma, was born out of the face Vaamadeva. He is blue in colour. He is one with Paraashakti and is protecting and nurturing all the worlds. He has given rise to Yajurveda and is its founder. He is the lord of sacrifices in the four-cornered sacrificial altar. He is also called Sanaatana and Vishnu. 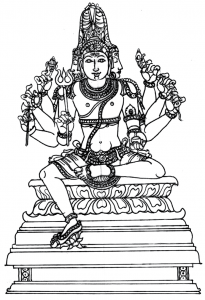 He is the founder of Daarushilpa (sculpture in wood) and Naukaashilpa (Dheemaan). He is the lord of the southern direction. 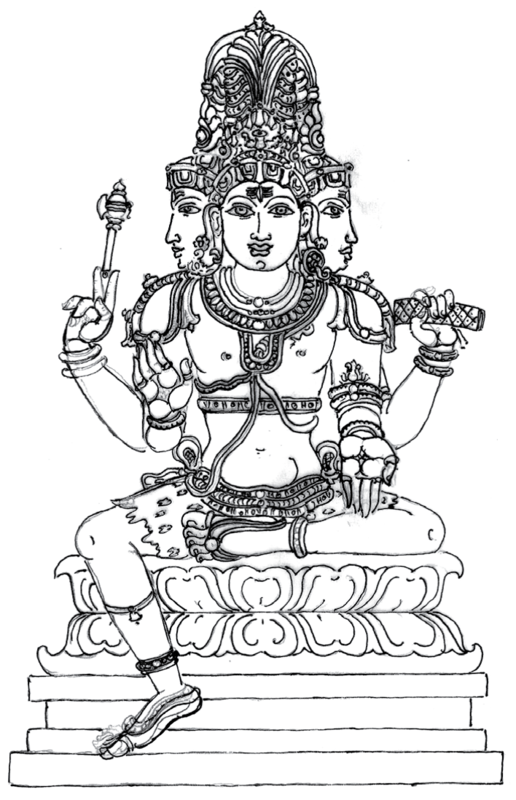 The third among the five brahmas is Tvashtru Brahma. He was born out of the Aghora face of Lord Vishvakarma. He is blood-red in colour and is the lord of Saama Veda. He is the lord of the circular sacrificial altar. He is the consociate of Icchaashakti. He is also called Ahabhoona and Brahma. He is the lord of the western direction. He has given birth to Saamaveda and is its founder. 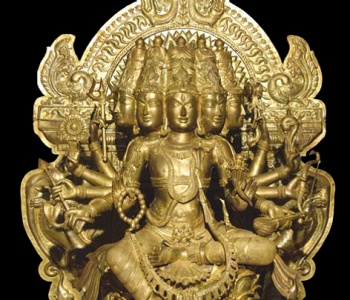 He is the founder of Kaamsya (brass) and Taamra (bronze) forms of sculpture. 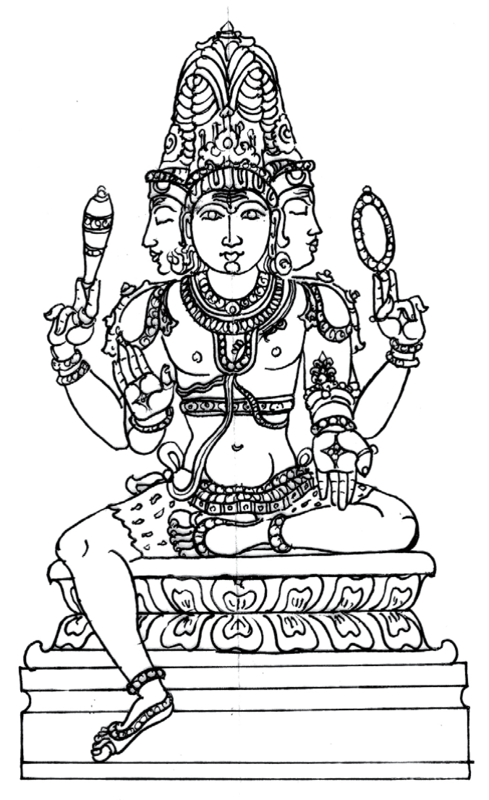 The third among the five brahmas is Tvashtru Brahma. He was born out of the Aghora face of Lord Vishvakarma. He is blood-red in colour and is the lord of Saama Veda. He is the lord of the circular sacrificial altar and is one with Icchaashakti. He is also called Ahabhoona and Brahma. He is the lord of the western direction. He has given the Saamaveda and is its founder. 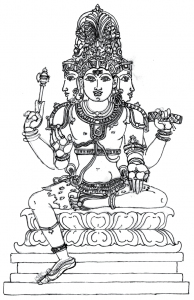 He is the founder of Kaamsya (brass) and Taamra (bronze) forms of sculpture. I meditate upon and worship Him. Shilpi Brahma was born from the Tatpurusha face of Vishvakarma and is the fourth of the pancha brahmas. He is of the colour of smoke and is also called Pratna and Indra. He is the lord of the sacrificial altar with six corners and is associated with Kriyaashakti. He is the lord of the northern direction. He is the founder of Atharva Veda and rock sculpture. Shilpi Brahma was born from the Tatpurusha face of Vishvakarma and is the fourth of the pancha brahmas. He is of the colour of smoke and is also called Pratna and Indra. He is the lord of the sacrificial altar with six corners and is associated with Kriyaashakti. He is the lord of the northern direction. He is the founder of Atharva Veda and rock sculpture. I salute Him. 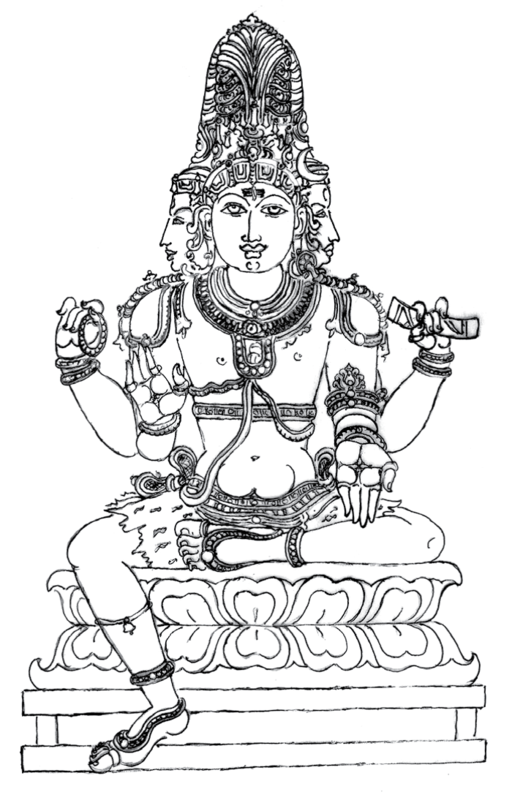 Vishvajna Brahma is the fifth among the five brahmas and was born from the Eeshaana face of Vishvakarma. He glows with the colour of gold. He is the lord of the upward direction and is also known as Suparna and Soorya. He is seated on a yellow cloud and has brought Pranava Veda. He is the companion of Jnaanashakti and is the lord of the sacrificial altar with eight corners. He is the founder of sculpture in gold (svarna shilpa). Vishvajna Brahma was born from the Eeshaana face of Vishvakarma, is the fifth among the five brahmas and glows with the colour of gold. He is the lord of the upward direction and is also known as Suparna and Soorya. He is seated on a yellow cloud and has brought Pranava Veda. He is the companion of Jnaanashakti and is the lord of the sacrificial altar with eight corners. May he, the founder of sculpture in gold (svarna shilpa), protect us always. Vishvakarma, the Celestial architect is not just a mythical persona but the legendary figure of a living tradition of Indian art and architecture. The traditional craftsmen and artists were come to be designated as the Vishvakarma Brahmins in course of time and they considered themselves as analogy of the divine architect Vishvakarma. The Rigveda, Mandala ten two sets of suktas are chants describing the creative power of Vishvakarma. 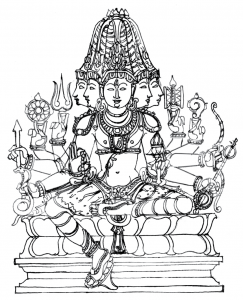 The ancient text Vishvakarmiyam is believed to be the direct form of science and art of vastushilpa rendered by Vishvakarma. 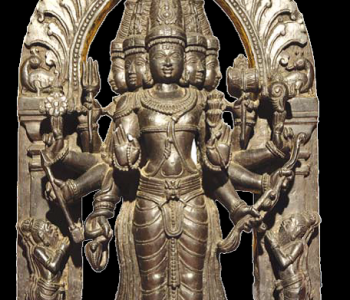 In some of the regions the vishvakarma tradition of iconography and iconometry are followed even today and the traditional sculptors of Karnataka are the true representatives of the cultural heritage of vishvakarma . I acknowledge the support of Mr. Naresh, master craftsperson, Artisan Centre, Canara Bank Bidadi for the drawings of Vishvakarma and Sanskrit rendering Miss. Madhuvanti, Research Scholar Jain University. 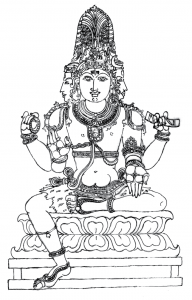 Sources for writing this part of text- Jnanananda, G. Kashyapa Shilpa Shastra (Uttarardha). Karnataka Shilpakala Academy. 1998:Bangalore. Jnanananda, G. Kashyapa Shilpa Shastra (Uttarardha). Karnataka Shilpakala Academy. 1998:Bangalore.